EWTS Observers and Inspectors work as independent contractors that are certified by NOAA’s National Marine Fisheries Service and the U.S Army Corps of Engineers. EWTS is always looking for independent, hard working, self-motivated people who perform well unsupervised and are willing to work at sea for extended periods of time. Preference for contractors will go to currently NMFS-certified Observers. Must have reliable transportation, an email account that is checked daily, and a personal cell phone. 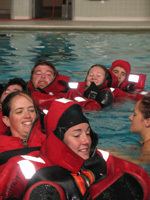 Have a Bachelor’s degree or higher in a marine or environmental field. However, exceptions may be made to individuals who have extensive at-sea or field experience. Must be physically fit, able to lift up to 50 pounds, and not susceptible to seasickness. If this sounds like a position you might be interested in, please email us your resume. Also you can review this website for the Fishery Observer position.